The permanent exhibition is dedicated to “The History of the Jews in Bohemia and Moravia”. This is the sequel to the first part of the historical exhibition located in the Maisel Synagogue. It depicts the history of the Jews from the late 18th to early 20th century. Portraits of prominent personalities along with examples of their work offer visitors a view of a traditional Jewish education, enlightenment, the Jewish school system, and science in the late 18th and early 19th centuries. The exhibition explains cultural, social and sporting activities of Zionist groups and organisations. The proportion of Jews in the development of the industry is represented today by existing major businesses founded by Jewish entrepreneurs (the match factory in Sušice, the Moser glassworks in Karlovy Vary, Prague ČKD). Another part of the exhibition presents Jews in the Czechoslovak Republic (1918-1938). The exhibition focuses primarily on significant cultural figures - writers and poets from the circle of German and Czech language literature, scientists and artists. Another section is devoted to the Holocaust of Czech and Moravian Jews (1939-1945). Archival sources and photographs from the museum’s collections document the persecution of Jews in the Protectorate of Bohemia and Moravia, mass deportations and life in the Terezin ghetto. Silver in Czech Synagogues. 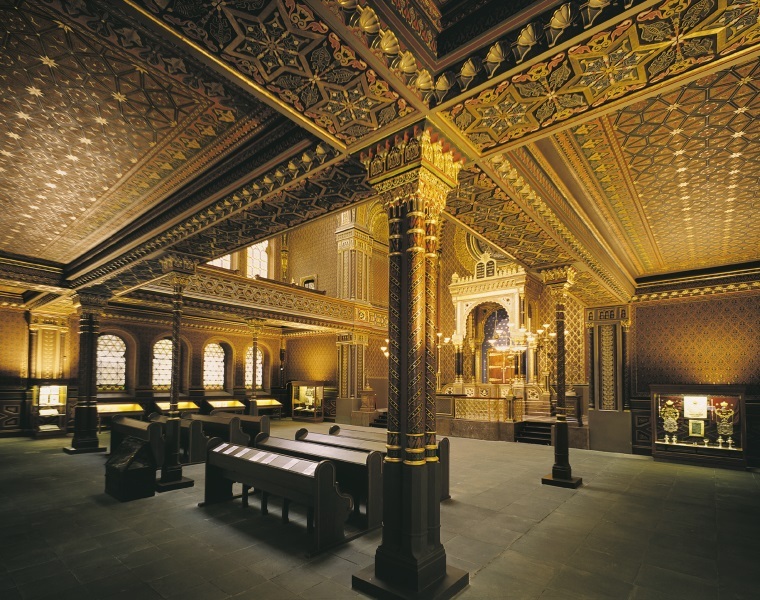 The silver collection of the Jewish Museum in Prague includes more than six thousand items, representing thirteen generations of Central European goldsmiths and silversmiths. Its present composition is influenced by many historical events that have left their mark on the number and types of items in the collection.